Photometer heads are used as sensors to measure photometric quantities. They provide a wavelength dependent response to incident radiation according to the spectral luminous efficiency V(λ) for photopic vision as required for photometric purposes. PRC Krochmann photometer heads represent state-of-the-art technology and can be found wherever precision and quality are prime considerations. They are distinguished by their compact design and reduced acceptance area. 광도계 헤드는 광량을 측정하는 센서로 사용됩니다. 필요에 따라 명 시야에 대한 분광 발광 효율 V (λ)에 따른 입사 방사선에 대한 응답 측광 목적. PRC Krochmann 광도계 헤드는 최첨단 기술을 대표하며 정밀도가 어디에서나 발견 할 수 있습니다 품질은 주요 고려 사항입니다. 컴팩트 한 디자인과 수용력 감소로 구별됩니다. 지역. 2 Spectral Correction Different light sources such as incandescent lamps, fluorescent lamps or daylight may feature vastly differing spectral intensity distributions. A sensor with insufficient V(λ) (eye sensitivity function) match calibrated with an incandescent lamp according to standard specifications will yield enormous errors in fluorescent lamp or daylight measurements due to the differing illuminants. The main reason lies in the steep drop in sensitivity of the violet-blue and red-orange regions of the V(λ)-function. Precise measurements therefore require a high degree of accuracy for spectral matching. The PRC Krochmann photometer heads use specially selected Si-photovoltaic cells. They feature a high stability over time, together with linearity owing to their electrical properties. The relative spectral responsivity characterising Si-photovoltaic cells is modified via computer-designed coloured filters to match the internationally standardised V(λ)-function. This is achieved via the full-filtering method in which, contrary to partial filtering, each filter covers the acceptance area of the photovoltaic cell completely. This not only streamlines manufacture but virtually rules out the influence of non-uniform illumination of the acceptance area. Each photometer head leaving PRC Krochmann's is individually tested for spectral correction quality, and is marked with the characteristics f1’ and and f1(Z)max. Defined in DIN 5032-6 and CIE publications no. 53 and 69, these parameters are distinguished from the less stringent error specifications frequently provided by other manufacturers. 2 스펙트럼 보정 백열등, 형광등 또는 일광과 같은 다른 광원은 크게 다른 기능을 가지고 있습니다 스펙트럼 강도 분포. 불충분 한 V (λ) (눈 감도 함수)가 일치하는 센서는 다음에 따라 백열 램프로 보정됩니다. 표준 사양으로 인해 형광등 또는 일광 측정에 엄청난 오류가 발생합니다. 다른 발광체들. 주된 이유는 V (λ) - 함수의 보라색 - 파랑 및 빨강 - 오렌지 영역의 민감도가 급격하게 떨어지는 것에 있습니다. 따라서 정확한 측정은 스펙트럼 매칭에 대해 높은 정확도를 요구합니다. PRC Krochmann 광도계 헤드는 특별히 선택된 Si 광전지를 사용합니다. 그들은 높은 안정성을 특징으로한다. 시간이 지남에 따라, 그들의 전기적 특성으로 인해 선형성과 함께. Si- 광전지를 특징 짓는 상대적인 스펙트럼 감도는 컴퓨터로 디자인 된 필터는 국제 표준화 된 V (λ) - 함수와 일치합니다. 이것은 전체 필터링 방법을 통해 이루어 지는데, 부분 필터링과는 달리, 각 필터는 광전지의 수용 영역을 완전히 커버한다. 이것은뿐만 아니라 제조를 간소화하지만 수용 영역의 불균일 한 조명의 영향을 사실상 배제합니다. PRC Krochmann 's를 떠나는 각 광도계 헤드는 개별적으로 스펙트럼 보정 품질을 테스트 받았으며 특성 f1 '및 및 f1 (Z) max. DIN 5032-6에 정의 됨 및 CIE 간행물 no. 도 53 및도 69를 참조하면, 이 매개 변수들은 구별된다. 덜 엄격한 오류로부터 에 의해 자주 제공되는 사양 다른 제조업체. 3 Directional Response According to the photometric quantity of interest, special requirements are placed on the directional response of a photometer head. PRC Krochmann photometer heads are geometrically and optically designed to meet the required directional response. 3 방향 응답 측광 량에 따라 특별한 관심사는 방향성 응답에 배치 된 광도계 머리. 중화 인민 공화국 광도계 헤드는 기하학적으로 그리고 광학적으로 필요한 방향성 응답. 3.1 Illuminance E Photometer heads used for general illuminance measurements with light incident from varying directions imperatively require good cosine correction, with the light striking the acceptance area being weighted with the cosine of the angle of incidence. This cosine correction is achieved by means of a diffusing cover. To ensure the quality of each cosine corrected photometer head, they are individually measured according to DIN or CIE standards, with the resulting f2 Fig 1: Typical normalised relative spectral responsivity s * rel(λ)in comparison to the V(λ)-function of a PRC Krochmann made photometer head Fig 2: Typical deviation in directional response to incident radiation of a cosine corrected photometer head manufactured by PRC Krochmann -— - V(λ) x - Photomer head 0 0,2 0,4 0,6 0,8 1 400 450 500 550 600 650 700 750 λ/nm rel. responsivity -4 -2 0 2 4 6 0 10 20 30 40 50 60 70 80 90 Winkel ε /° f (ε) /% e-mail: prc@prc-krochmann.de http://www.prc-krochmann.de 3 parameter specified on the test sheet available upon request. Cosine corrected photometer heads may be ordered by specifying "C" (ref Table 2). A good cosine correction will be required for illuminance measurements:  of indoor and outdoor lighting installations  of daylight  using a sphere photometer  within a goniophotometer for luminous flux measurement  in scale model rooms Applications in photometric laboratories involving perpendicular light incidence upon the acceptance area, or the measurement of point sources, do not necessitate cosine correction. This is invariably the case with: photometric bench measurements long-distance goniophotometric measurements of luminous intensity These applications will benefit from a photometer head without diffuser, fitted with a diaphragm (order designation B). This type of construction is known as aperture mode type photometer head. The influence of non-uniform illumination of the light acceptance area is then negligible. This property plays a notable part with laboratory measurements and goniophotometric luminous intensity measurements of luminaries and projectors. On applying photometer heads as transfer standard (luminous intensity or illuminance) the aperture mode type is preferred. The diameter of the diaphragm (acceptance area) is normally 8 mm, but can be made up to 25 mm. 3.1 조도 E 일반용 포토 미터 헤드 빛으로 조도 측정 다양한 방향에서의 사건 비상식적으로 좋은 코사인이 필요하다. 정정, 빛을 비추면서 수락 영역에 입사각의 코사인. 이 코사인 보정은 확산 커버 수단. 보장하기 위해 각 코사인의 품질이 수정되었습니다. 광도계 머리, 그들은 개별적으로 DIN 또는 CIE에 따라 측정 표준, 결과 f2 그림 1 : 표준화 된 상대 스펙트럼 반응성 * rel (λ) 비교 PRC의 V (λ) 함수에 Krochmann 만든 photometer head 그림 2 : a의 입사 방사선에 대한 방향 응답의 전형적인 편차 PRC Krochmann 제조 코사인 보정 광도계 헤드 - - V (λ) x - 포토 머 헤드 0 0,2 0,4 0,6 0.8 1 400 450 500 550 600 650 700 750 λ / nm rel. 응답 성 -4 -2 0 2 4 6 0 10 20 30 40 50 60 70 80 90 윙켈 ε / ° f (ε) / % 전자 메일 : prc@prc-krochmann.de http://www.prc-krochmann.de 삼 요청시 사용할 수있는 테스트 시트에 지정된 매개 변수. 코사인 보정 된 광도계 헤드는 "C"를 지정하여 정렬합니다 (표 2 참조). 조도 측정에는 좋은 코사인 보정이 필요합니다. ? 옥내 및 옥외 조명 설비 ? 일광 ? 구형 광도계 사용 ? 광속 측정 용 고니 오 포토 미터 내에서 ? 저울 모형 실에서 수용 지역에 수직 한 빛의 발생과 관련된 측광 실험실에서의 응용, 또는 점 소스의 측정, 코사인 보정이 필요하지 않습니다. 이것은 언제나 다음과 같은 경우입니다. 측광 벤치 측정 장거리 광각 광도 측정 이러한 어플리케이션은 격막이없는 광도계 헤드의 이점을 누릴 수 있습니다 (주문 지정 비). 이러한 구조는 조리개 모드 광도계 헤드로 알려져 있습니다. 비 균일의 영향 수광 영역의 조명은 무시할 수있다. 이 호텔은 실험실에서 주목할만한 역할을합니다. 조명 장치 및 프로젝터의 광도 측정 및 광각 광도 측정. 신청시 광도계 헤드를 전송 표준 (광도 또는 조도)으로 사용하면 조리개 모드가 바람직합니다. 다이어프램의 직경 (허용 영역)은 일반적으로 8mm이지만 25mm까지 가능합니다. 3.2 Cylindrical Illuminance Ez The cylindrical illuminance EZ at a point of a vertical axis is the mean value from the sum of all vertical illuminances found around this axis. Some standards make use of this quantity in the determination of modelling in interior lighting installations. A compact photometer head with the corresponding directional response is available from PRC Krochmann (order designation EZ). Its parameters are individually ascertained and recorded on a test sheet. 3.3 Semi-cylindrical Illuminance Ezh Analogous to the cylindrical illuminance Ez, the semi-cylindrical illuminance Ezh is said mean value computed for one semicircle only. This quantity provides a measure of good visibility in pedestrian areas as concerns safety. The PRC Krochmann Ezh photometer head (order designation EZH), is equally subjected to quality testing with subsequent recording in a test sheet. 3.4 Spherical Illuminance E0 The spherical illuminance E0 is the integral of the luminance computed over the complete sphere surface. With point sources the response must therefore be independent of the direction of incidence. The PRC photometer head for E0 (order designation E0) consists of a small diffusing sphere fitted internally with a device allowing the correct required directional response. 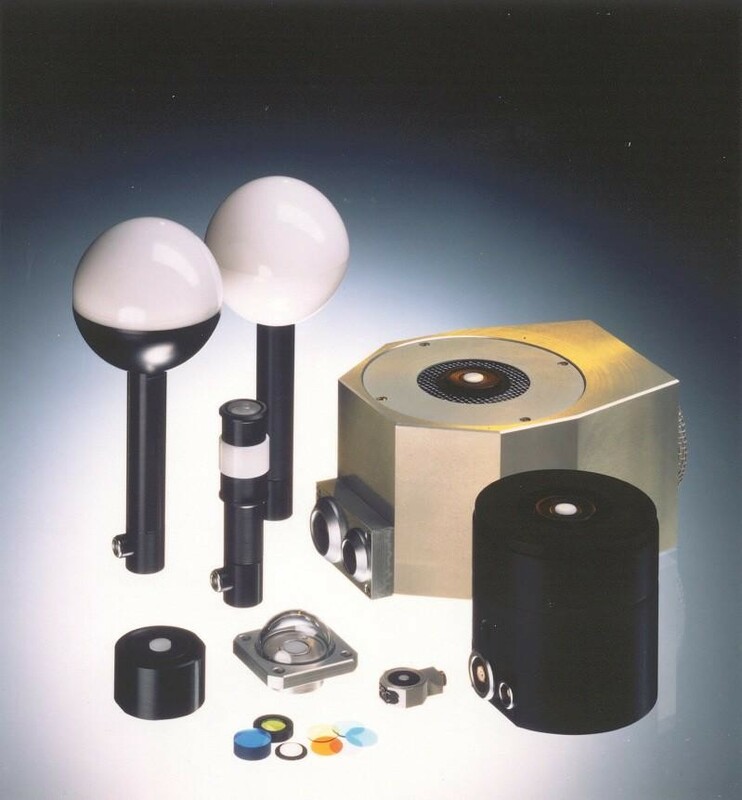 The parameters of each manufactured photometer head are tested and specified individually. The application areas are limited to plant illumination and some speciality studies involving interior lighting. 3.2 원통형 조도 Ez 수직축의 점에서의 원통형 조도 (EZ)는 모든 수직 이 축을 중심으로 한 조도. 일부 표준은 모델링 결정시이 양을 사용합니다 실내 조명 시설에서. 대응 방향성 응답을 갖는 소형 광도계 헤드는 PRC Krochmann (주문 지정 EZ). 그 매개 변수는 개별적으로 확인되고 테스트 시트에 기록됩니다. 3.3 반 원통형 조도 Ezh 원통형 조도 (Ez)와 유사하게, 반 원통형 조도 (Ezh)는 하나의 반원 만. 이 양은 안전과 관련하여 보행자 구역의 양호한 가시성을 측정합니다. PRC Krochmann Ezh 광도계 헤드 (주문 지정 EZH)는 다음과 같은 품질 테스트를 동일하게받습니다. 테스트 시트에 후속 레코딩. 3.4 구면 조도 E0 구면 조도 E0는 전체 구면에 대해 계산 된 휘도의 적분입니다. 와 따라서 점 응력원은 응력의 방향에 독립적이어야한다. PRC 광도계 E0 (주문 지정 E0)의 헤드는 내부에 장착 된 작은 확산 구체로 구성되며 올바른 방향성 응답. 제조 된 각 광도계 헤드의 매개 변수가 테스트되고 개별적으로 지정됩니다. 응용 분야는 식물 조명 및 실내 조명 관련 전문 연구로 제한됩니다. On request the two wire current loop output can also be delivered for a grounded sink. Suitable measuring amplifiers in a separate housing (i.e. for wall or T35 T-bar mounting) can be offered according to customers specification. 요청시 두 와이어 전류 루프 출력을 접지 된 싱크에 전달할 수도 있습니다. 별도의 하우징 (즉, 벽 또는 T35 T 바 장착 용)에 적합한 측정 증폭기는 다음과 같이 제공 될 수 있습니다. 고객 사양.